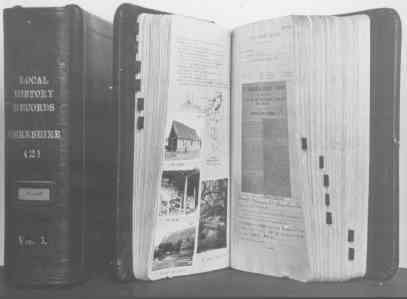 We have a first-hand account of local life during WWII by Burley Ridler, although he didn't record the events until the early 1950s, under the Local History Recording Scheme. Local newspapers gave us a different perspective, because they recorded the events as they happened (sometimes under the cloak of anonymity - but everyone knew, for example, that a 'local Technical School' was at Arborfield Garrison). 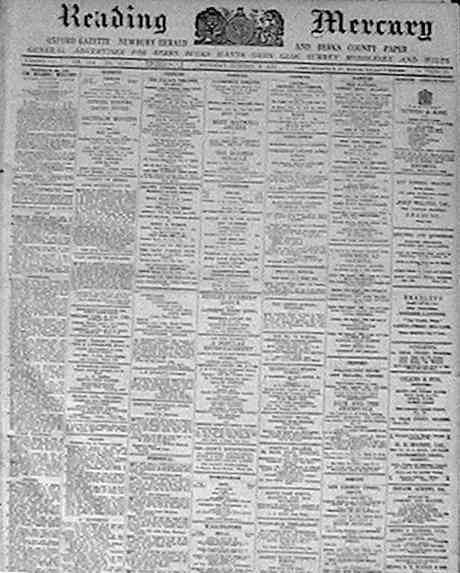 Most of the small news items documenting every last Whist Drive were in the 'Reading Mercury', but others did appear in the 'Reading Standard' and the 'Berkshire Chronicle' (all on microfilm at Reading Local Studies Library), and 'Times and Weekly News' (on microfilm at Bracknell Reference Library). The story really began around 1937 when it was announced that the old Remount Depot, a major local employer, was slated for closure amid great fears for the local economy. At the same time, local councils were actively preparing for war; Reading Borough Council and Berkshire County Council appointed their Air Raid Precautions (A.R.P.) Officers by late April. Local news embraced 'Ambulances for the Spanish Civil War', donated by Reading townsfolk. The first newspapers of 1938 reported on progress with air-raid precautions, with ditches being dug and shelters erected in and around Reading. In Arborfield, the Remount Depot had been renamed the Ordnance Depot, and wooden huts were being erected behind the entrance on what is now Sheerlands Road. The daughter of an employee at the Ordnance Depot, 10-year-old Joan Barker, died after a short illness, and the local paper reported that her fellow pupils lined the pathway to the church at her funeral, each carrying a bunch of flowers. On April 1st 1939, the 'Mercury' announced plans for a simulated air raid, with a 'Black-Out exercise' to be held from midnight on Saturday May 6th to 3 a.m. on Sunday May 7th. The 'Mercury' reported on the results of the simulation in the Reading area, while the 'Times and Weekly News' went into some detail on what happened in and around Wokingham. While most of the village was not yet on mains electricity or water, the Army Technical School was being equipped with all modern conveniences. During 1939, the Ordnance Depot site was rapidly developed to accommodate Militia men who had been called up for 6 months' service, and some complained of the conditions around the camp, in particular the over-crowded and expensive bus service to Reading. The war claimed its first casualty in Arborfield just a week after hostilities commenced, when a soldier was run over and killed by a bus in blackout conditions outside Duck's Nest Farm. The black-out helped to cause another fatal injury in April the following year when poor William Morland was killed. 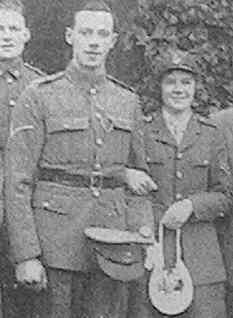 It was common at the time for the bridegroom to marry in uniform, but both Mary Inglis and her husband Gordon Stead (pictured left) wore military uniform. In a first for Arborfield, Freda Devereux wore Salvation Army uniform, marrying at the Salvation Army Hall in Arborfield. The Royal Merchant Navy School, at the northern end of the parish at the Bearwood mansion, was often in the news. School activities stepped up a gear in 1938 when the part-time chaplain, the Bearwood Rector Rev. Bayley, was replaced by a full-time chaplain (though Rev. Bayley remained as Rector for some years). At the 1939 Speech Day, the Resident Governor pointed out: “The general public do not yet appear to realise their debt to the fathers of these children, and to others of our merchant navy officers and men”. Bearwood was connected with Arborfield parishioners on Remembrance Sunday, 1939, when the British Legion branch for Arborfield, Barkham and Bearwood paraded there. 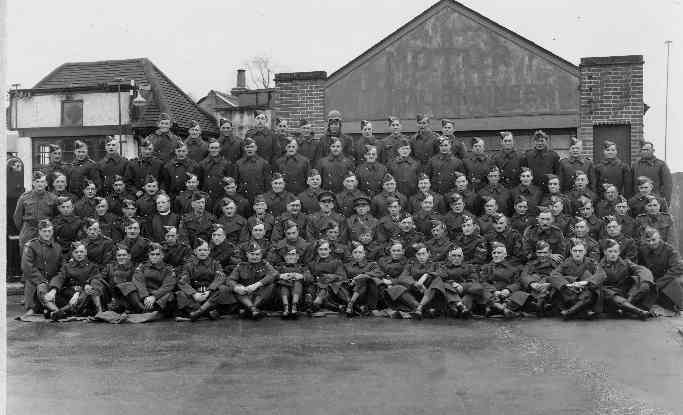 The following year, many of the same people were in the Home Guard, and paraded to the Chapel in the R.M.N.S. at Bearwood. The Home Guard and the Royal Observer Corps were very active in Arborfield during the war, but the only news items were Remembrance Sundays and socials, and the final stand-down in December 1944. The members continued to meet during 1945 as the 'Newland (H.G.) Rifle Club'. The newspapers noted a fair number of thefts at the Garrison, as well as other misdemeanours. Hunting continued during the war, but it appears that the choice of venues was more restricted. There don't seem to have been any meetings based on the 'Bramshill Hunt' P.H., where the road would have been too busy with Army lorries. Instead, the local meetings seemed to start at the 'Mole' Inn. which of course had close links with nearby Newlands Mansion. Riders were warned to be careful not to trample on growing crops. Meanwhile, villagers made extra efforts to grow their own vegetables and keep livestock, with considerable success. Pupils from Arborfield School had their own allotment, and also helped in the gardens of those in the village whose men-folk were in the Services. They kept fit in other ways, and in the 1944-45 football season won many matches. Although the School wasn't subject to the overcrowding of several Reading schools that shared their buildings with evacuees, its facilities were used to the full. 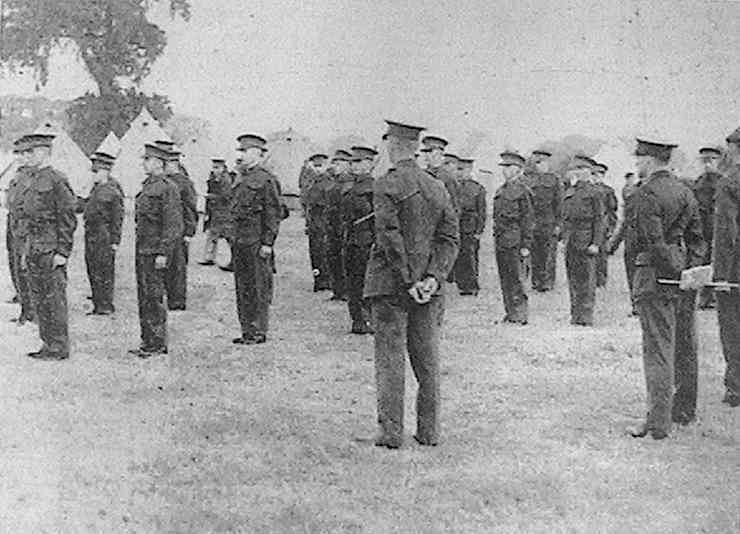 For some reason, the Evening Institute had been moved to Three Mile Cross in the late 1930's, but it was moved back in 1942, along with a new Flight of the Air Training Corps. By 1944, this initiative had resulted in six cadets joining the Air Force as members of aircrew or ground staff. There were other regular news items about the school throughout the war. Despite the lack of space, the newspapers showed photos and carried small news items on local people in the Armed Forces. Some won awards; others were taken prisoner, wounded, killed or missing. By 1943, some Prisoners of War were being repatriated among much celebration; one had to wait until the end of 1945. Apart from the deaths of their loved ones on active services, there were some tragic incidents in the village. In February 1941, toddler Ruby Barker was killed when a candle in her bedroom set light to the furniture. Another baby was involved in an accident outside the village shop in 1944; although the baby was unscathed, her mother, 22-year-old Mrs. Muir, later died in hospital. Despite the lack of space, the newspapers still managed to report the more timely deaths of older residents, and to celebrate the weddings, mostly with the bridegroom in uniform. Public notices tended to appear on the front pages, while less official exhortations appeared in advertisements inside the newspapers. The newspapers were very careful not to give any detail about bombing raids, because this information would have been useful to the enemy. However, the locations were sometimes published months later, or after V. E. Day. By June 1945, the Berkshire County A.R.P. Officer was able to give detailed a detailed breakdown of bomb attacks by type of bomb, year, and location. 'At the annual meeting of the Arborfield Parish Council, the chairman, Mr. A. H. Capper, spoke of post-war developments in the village in housing, lighting, drainage, etc. He understood that electrification would be possible almost immediately after the war'. However, it took several years for these mooted developments to become reality. 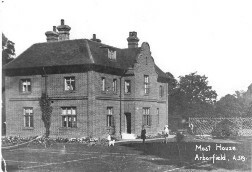 In the meantime, returning soldiers and their families couldn't wait for new houses, so many old Army camps and requisitioned buildings, including Arborfield Hall, were occupied by "Squatters".